Tabletop: Much of our focus at Millyn’s is on casual dinnerware, fine china, flatware, crystal, glassware, and table linens. Millyn’s aim is to present a range of product in both quality and price, and to offer its’ customers this range of merchandise with knowledgeable help. Millyn’s has in stock more than 375 patterns of table ware. The selection is constantly changing and updating. We offer everything from Fiesta dinnerware to Lenox Marquessa Coutoure and Waterford hand cut crystal. 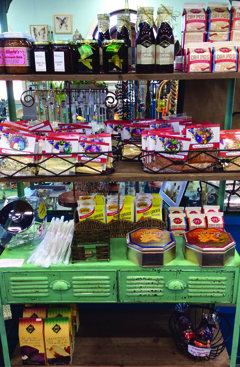 Kitchen accessories: Millyn’s carries just about everything you need for your kitchen, including fine quality cookware, bake ware, kitchen gadgets, kitchen towels and dishcloths, aprons, canister sets, as well as acrylic, bamboo, ceramic, and pewter serving pieces. Home Fragrance: Candles, reed diffusers, potpourri, and room sprays from companies such as Aromatique, Wood Wick, Swan Creek, and Root. 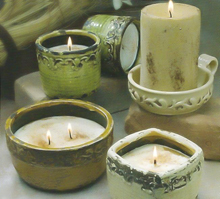 We stock seasonal candle rings for your candles. Plus, we carry the areas best selection of wax melts and unique melters. 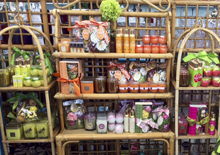 Personal Care: Bath soaps, lotions, shower gels, body butter, etc., from Seda France and Niven Morgan, as well as the ever-popular Poo-Pourri. We have also recently added Duke Canon personal care products for men, such as the "Big American Brick of Soap", superior grade shaving cream, superior grade hair wash, and "bloody knuckles" hand repair cream. Decorative Accessories: Huge array of frames, ceramics, pewter and other metal pieces, even some small furniture, along with a large assortment of indoor/outdoor rugs by Jelly Bean that are machine washer & dryer safe. Arkansas Razorback Merchandise: picture frames, picnic totes, blankets, pillows, night shirts, coasters, ceramic serving pieces, metal pieces, stone plaques, scarves, drink dispensers, Christmas ornaments, business card holders, wallets, tempered glass cutting boards, Tervis tumblers, Bentley patio glasses and pitchers, piggy banks, and much more! Baby Gifts: Millyn’s has an entire section of the store dedicated to babies and toddlers including piggy banks, dish sets, flatware sets, tea sets, books, small furniture, cabinets, and a huge selection of toys for newborns and up. Permanent Florals: We will custom make arrangements, wreaths, and cemetery pieces for you, or simply let you choose from our large inventory of stems, bushes, fruits, and vegetables.